While David Halberstam was in Vietnam as a war correspondence, it was easy to hear news from the North Vietnamese leaders about peace marches and protest statements from leaders back home, but "news about their military setbacks or the means Hanoi employed in prosecuting the war was rather hard to come by." This is the information in the famed New York Times journalist's most acclaimed book, 1972's The Best and the Brightest, that is fascinating. Unfortunately, that excerpt is from the foreword, written by Vietnamese prisoner-of-war and U.S. Senator John McCain, not Halberstam. 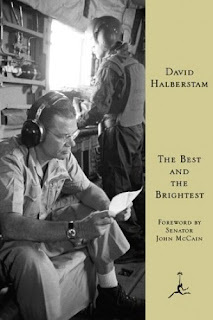 The bulk of Halberstam's story focuses on the foreign-policy mechanisms back home, namely the U.S. government and Kennedy, Johnson, and Nixon administration officials who so badly misjudged -- despite being the country's "best and brightest" -- the enemy's resolve, America's power, our South Vietnamese allies, the Soviets, the Chinese, the world, and, most of all, themselves. There is some interesting commentary on the life of a journalist, such as how to treat coverage of JFK, who was in a position traditionally given (mostly) full respect by the White House press corps and what happens is you have fewer bylines while overseas at war (does the journalist "disappear" in reality along with those bylines?). Many of these types of questions became part of the required dialogue for decades afterwards in J-schools, newspapers, and PR firms. So for that reason, I think Halberstam deserves some credit and respect. But as a detailer of the politics of the period, I'm less impressed than the adoring mass of critics before me. Halberstam definitely digs deep, but it's exactly that detail that bogs the book (and, hence, the story) down. The sheer amount of characters and detail becomes so confusing that I lost the ability to care for any of them and actually gave up on the book fairly early on. I'm sure some of my readers whole-heartedly disagree. If so, please point me to a later chapter or two that I "must" read. Then I might reconsider my negative reaction to what is largely considered Halberstam's greatest work. Until then, I'm setting this book aside.